The modernist landscape architect James Rose undertook the design of a native woodland garden in a picturesque style, with promenades, terraces, and naturalistic ponds that dramatically cascade through the garden starting at the first floor entry elevation on down to the lower garden and pool 20 feet below. Our project involved the design of a connecting structure that could float over 15 feet of elevation and link two blue stone terraces set at either end of the house. We took our design cues from the garden, proposing a suspended ’bridge’ terrace of trapezoidal form made of redwood lumber and thin steel. Accessible from all the public rooms on the first floor, it also serves as a viewing platform looking down the length of the garden to the pool below and the horizon beyond. A sculptural bench rendered in aluminum plate floats above the deck surface, and invites a stop to admire the view. A table hovers nearby supported by slender stalks extending up from the ground below. Modern and minimal in its construction and design, it nonetheless blends into the landscape due to its high construction and echoes the owner’s contemporary art collection. 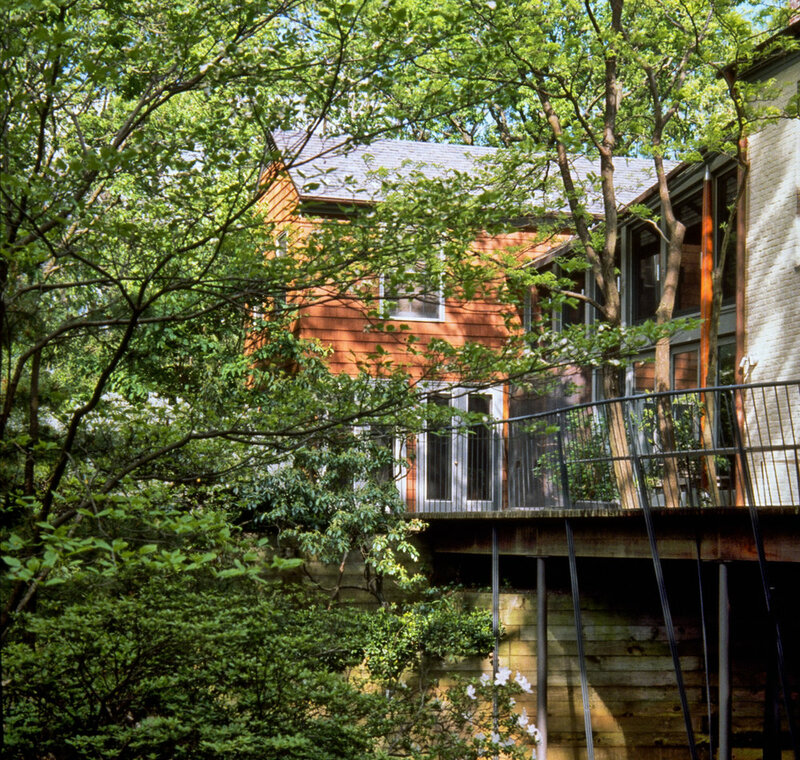 This project received the 1997 Design Award in Architecture from the American Institute of Architects New York Chapter.